After I've suffered almost two years of Little Free Library envy, you're cordially invited to the grand opening of the first Little Free Library in Adams Hill (Charter #8424) on Sunday, August 9th, 2015 from 4pm - 5pm. About two years ago while surfing online I came across the concept of the Little Free Library and instantly fell in love. It turned out I had been driving by one on my commute regularly and had always wondered what it was and what was going on. I immediately had big dreams for building my own. I surfed their website for ideas and building plans. I registered for my placard. I received my placard. I drew up elaborate plans for building my own. I debated buying new parts versus recycling or upcycling parts. [Trigger warning for bibliophiles: addictive material to follow] I spent hours surfing photos of Little Free Libraries on their Facebook, Pinterest, Instagram, and Flickr pages. This is when Little Free Library Envy set in… for almost two years. I’ve finally broken the spell! Supplies have been purchased. Work has commenced. Drilling and mounting have been completed. 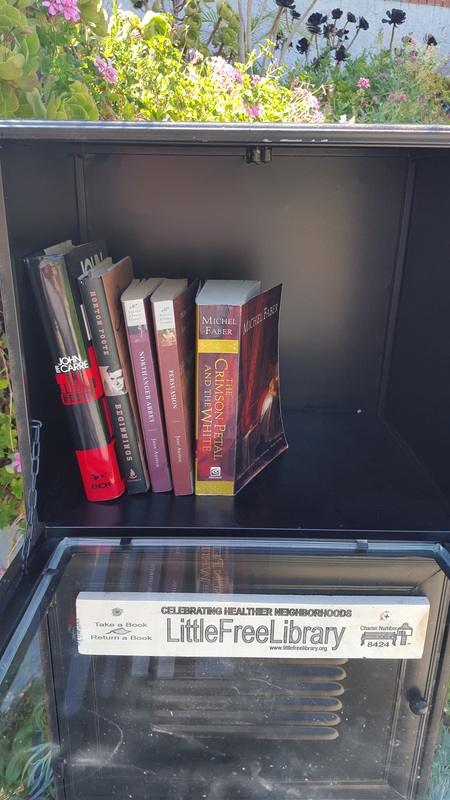 The first branch of the Adams Hill Little Free Libraries is now open! You’re cordially invited to the grand opening of the first Little Free Library in Adams Hill (Charter #8424). Lemonade and cookies will be served. Come chat with your neighbors, say hello, and check out the library. If you’re so motivated, feel free to bring a book (or two) to help stock the library. The books in our library are always free and never for sale. Feel free to take a book. If you have a book you’d like to share, please feel free to donate it. When you’re done with your book: return it, pass it along to a friend, or release it back into the wild. You don’t need to “check the book out” or “check it in”, but we do encourage you to sign our guest book and participate via Book Crossing. First, What is a Little Free Library? It’s a “take a book, return a book” gathering place where neighbors share their favorite literature and stories. 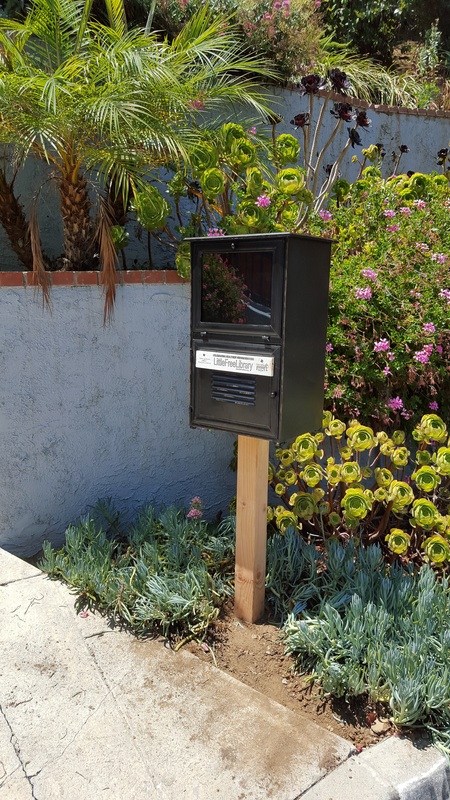 In its most basic form, a Little Free Library is a box full of books where anyone may stop by and pick up a book (or two) and bring back another book to share. You can, too! If you want to learn more about the movement or host your own Little Free Library, please visit their website. 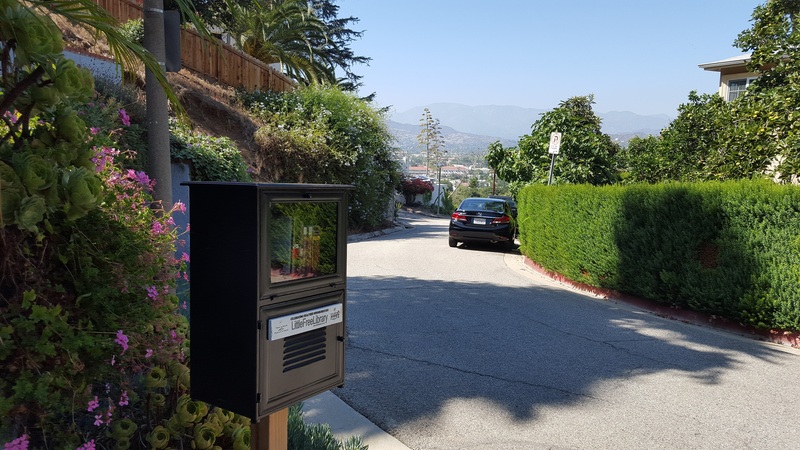 Little Free Library Charter #8424 is located at 1411 Dartmouth Drive, Glendale, CA 91205. It is located at the dog-leg on Dartmouth on the west side of the street. It is just west of S. Adams Street, roughly at the top of the hill. Though Chris built and hosts the library, he’s simply a steward or caretaker, of the branch. The library is free and open for the use of our friends and neighbors in Adams Hill and the surrounding neighborhoods. If you’ve stopped to check things out, you’re automatically an associate librarian. It is appreciated if everyone helps to care for and maintain the library. You don’t need to “check the book out” or “check it in”, but we do encourage you to sign our guest book and participate via Book Crossing [see below]. Since there isn’t a full time librarian and only so much space, there isn’t (usually) a set order to the arrangement of our books. Since it’s been a long trip up the hill, feel free to stop for a minute to cool off, consider yourself an associate librarian, and rearrange them to suit your whimsy – it is your neighborhood library after all. We only ask that you try to keep any children’s books on the lower shelf for short legs and arms to be able to reach, and that your arrangement ensures all the books fit into the library just in case it rains. The options are infinite, so be creative. Pending people updating the location of books removed, check availability at our Book Crossing Zone. We gladly accept your donated books. 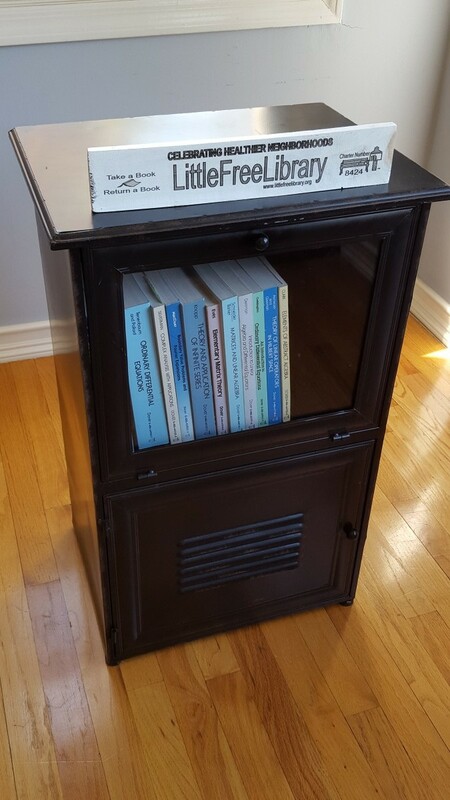 If you have more books than the little library will fit, please don’t simply dump them! You can leave them in a covered box preferably on our stairs/landing – this will keep our sprinklers and the elements from ruining them or you can contact me through Nextdoor.com. If the library has more books than will fit, we’ll occasionally rotate them to help improve the diversity of the available collection over time. Our library has guest book and a pen. Feel free to write down any thoughts, comments, or suggestions you might have about the library and leave them in the library for the other associate librarians who happen by. You’ll find a red composition book (and pen) inside our library where you can leave your thoughts and comments. Kindly leave the guest book in the library – it’s the one book we have that doesn’t circulate! Patrons/Associate Librarians are encouraged to (optionally) write in the books they donate or check out. Say hello to your fellow neighbors! You can simply write down the day and time of your visit along with a note for future visitors. Liked a book you borrowed? Flip back into the guest book to see who made the donation and write in a thank you to the donor. Have a book you’ve been longing for? Write it in and maybe a fellow neighbor has a copy they can donate on a future visit. Visiting our branch from far away? Be sure to write down your hometown and country so we know how far away our books travel. Maybe you’re waxing poetic when stopping by? Feel free to write a short poem or haiku about our library. Write down any books you’d love to see come to our library so you can borrow them in the future. Read the list to see if you have any of the books you might donate so that others can enjoy them. For those interested in my particular process, here’s how I did it. Recently I saw something a bit more quirky and interesting than my original plans that I could up-cycle, so I made the purchase (happy belated birthday to me)! 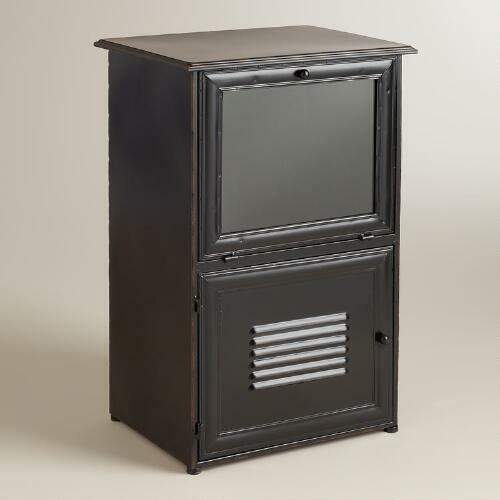 It was a nice little metal newsstand that Cost Plus World Market had put on clearance as they’re no longer going to carry it. The last one the store had was a bit dinged up and had some scratches, so I negotiated an additional discount. It’s got two spacious shelves with two doors including a glass fronted one, and it’s got the capacity for at least 6 linear feet of books. 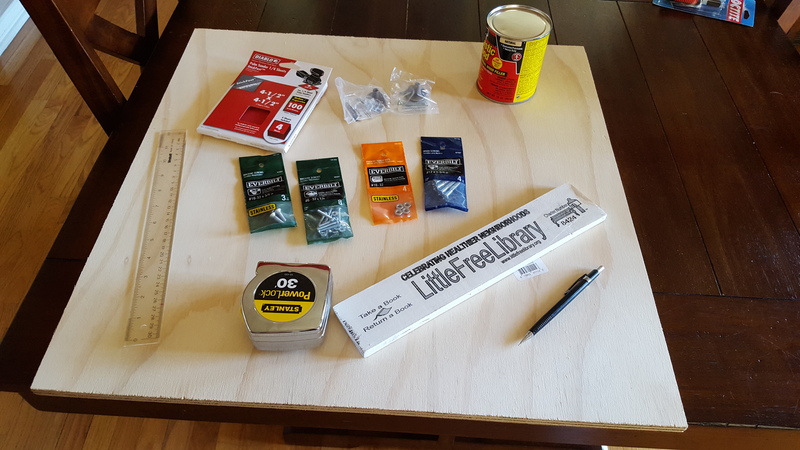 A trip to the hardware store for a small sheet of plywood, an 8′ post, and some wood screws, machine screws and nuts finished up the material needs. I cut the post down to 54″ and cut the plywood down to fit underneath the newsstand. I pre-drilled some small holes in the plywood to screw the plywood down onto the post. Then I drilled holes into the bottom of the newsstand and fit it down on top of the plywood and attached with the screws and nuts. Following this, I dug up a handful of seeder books, registered them with BookCrossing.com and put them on a GoodReads.com shelf, and put them into the library. We’ve technically been open for a week and without any publicity at all, we’ve had over a dozen books flow through the library already. Total cost out the door: just under $200. The library finally planted in the ground.